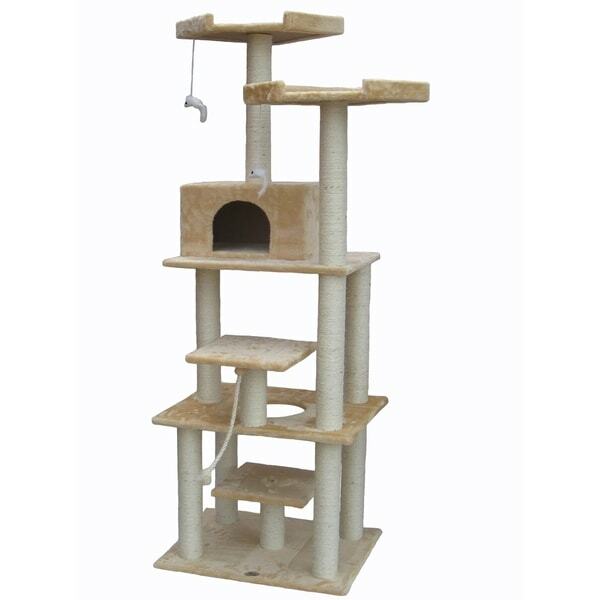 Keep your cats entertained for hours with this six-foot, four-inch cat tree that has 11 scratching posts and four perches. This playground paradise features two dangling cat toys and a hanging rope to encourage your feline friends to play and a cat condo for resting. The natural color palette is neutral enough to match any existing decor. Sprinkle a little cat nip on this cat tree to get your kittens ready to play. Our cat, Sanchez, has a great time jumping in and out of his tree. Also, it's nice whwn he wants to get out of the way of our dog, Shecky. This cat tree came as described, after assembling and using it for about a month, both of the top posts became unstable. After taking them off to inspect, the internal threads had been pushed into the product. I will be returning this product. Our cat loves this tree! We purchased this to give our cat her own space to play, scratch, and relax. We placed it in front of a window. This cat tree was quick and easy to assemble. It is a little wobbly but sturdy. It took our cat a little time to warm up to it, but she really enjoys it now. She is a normal adult size cat and doesn't fully fit into the condo part so, she backs herself inside so that she can look outside the window at the world. She uses all of the perches in some way. I would definitely say it has been worth the money! My cats love lounging on the top. The post are a great place for them to scratch. This tower is beyond amazing!! My husband and I have had our cat, Rocky, for 4 years. We decided about a year ago to adopt a puppy, Apollo. Since bringing our handsome puppy home, all of Rocky’s toys have been claimed by Apollo. We knew we had to get some just for Rocky. Once we finally decided on a cat house I began researching. I never knew how many different options there were out there. Our first cat treehouse we purshased at a local pet store. We had it for a day and returned it! The quality was terrible and our cat wasn’t amused with it. Once I came across this car treehouse, I thought to myself, why not try it out. It was shipped to us fairly quickly and was extremely easy to put together. As soon as we brought the box inside and opened it, Rocky, started going crazy. The only reason why it took us a little bit to put together was due to Rocky playing with each piece every step of the way. He hasn’t gotten down since we finished it. I wish I found this sooner! this cat tree is nice and streamlined, neatly structured. i have mine right in my living room. it is very high, my cat loves it, she's always lounging on the top 2 platforms. my son put it together for me in about 15 minutes! upon watching him, i could see i probably could have done the simple assembly myself. your cat will love it!! Our cat loves this! this product is made well and was easy to assemble. Good cat tree for the price. Made of particle board and the nuts will pull out of the post ends after extended use by large cats such as mine. replacement posts can be purchased for $10 each if you know where to look. forget about placing this in damp/wet environment. it will fall apart. We have two wild kritters and they took to this immediately. One of them is 19 pds and he has no problem fitting on the top platforms or even occasionally checking out the little house. They are using the scratch posts extensively and leaving the furniture alone. Yeah! One of the top columns broke off when my son (he's 5' 7'' and 150 pds.) leaned again it. The plastic mechanism inside the column to hold the bolt is not designed to deal with people weight. My husband is a master at fixing things, so he glued and screwed it back together. The whole structure is "flexible" which is probably good so that is doesn't break under the antics of the cats. I have a big cat and it's very narrow to get around. Also it's top heavy and wobbles. It's too high and freaks the cat out. I redesigned it and lowered it and it's now her favorite tree by the window. This is everything I hoped it would be at a good price. It is nice-looking and was easy to assemble. The cats love it. I wanted a tall cat tree and this one came at a very good price. "is it true to the color iin the picture?? like a light brown/caramel/off white posts?"